From January 9 to 12, thousands of tech companies from around the world gathered in Las Vegas, as they’ve been doing for over 50 years now, to showcase their latest products and innovations at the Consumer Electronics Show (CES), and we’ve prepared a list of the most interesting tech shown off at CES 2018 so you know what product releases to expect in 2018. Computer convergence, the ability of a single device to assume the roles of multiple different devices, was a big thing back at CES 2013. But it’s only now, thanks to Razer, that it seems to have arrived in a form that’s actually usable and desirable. In November 2017, Razer announced its first Android smartphone, the Razer Phone. It’s now clear that Razer’s plans were grander than what many have assumed at the time of the phone’s release. At CES 2018, Razer introduced the Razer Project Linda, which is a gaming laptop that relies on the Razor Phone for processing and touch input. As such, Razer’s Project Linda bridges the gap between the ultraportable mobile world and the convenience of traditional laptops, allowing gamers to enjoy their favorite games on a large screen and making on-the-go productivity even more affordable than it is right now. LG’s Gram line of premium laptops isn’t new, but its latest refresh makes it irresistibly appealing. At CES 2018, LG introduced the refreshed versions of the 13.3-, 14-, and 15-inch models of the LG Gram, with the smallest model boasting a battery life of up to 22.5 hours thanks to the jump to a 72 Wh battery. The refreshed LG Gram laptops feature Intel’s 8th-generation Core i5 and i7 processors, fast SSD storage, Thunderbolt 3 support, a backlit keyboard, DTS Headphone:X 11.1-channel surround sound, and Full HD IPS display with a broad color gamut for lifelike picture quality. What’s more, LG Gram laptops have passed seven industry-standard tests to prove their military-grade durability, which is rather surprising considering their elegant appearance. Available on Amazon. Sony is bringing back its beloved robotic pet, which was first introduced in 1999 and sold until 2005. AIBO, as Sony’s robodog is called, has learned a couple of new tricks since 2005, including the ability to gather data from its owner to realistically react to voice commands, petting, and toys. 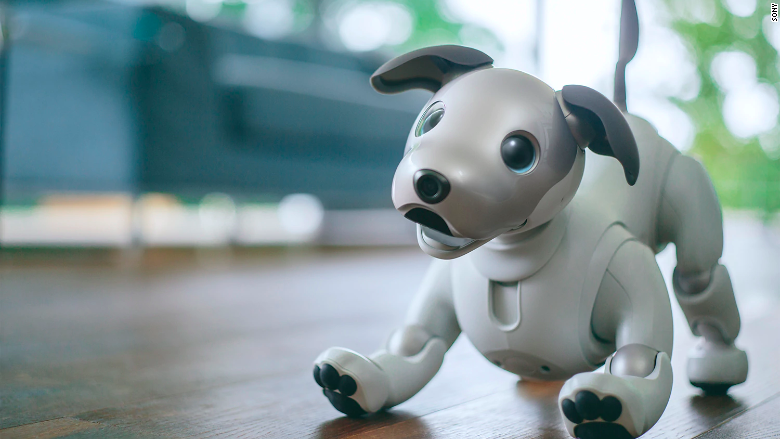 The new version of AIBO connects to a mobile app, which allows its owner to adjust its programming and access the photos taken by the dog using the cameras embedded in its adorable eyes. The cameras also help AIBO detect human emotions and better react to its surroundings. Because AIBO relies on artificial intelligence, no two AIBOs are the same and no AIBO stays the same for long, always learning new expressions, tricks, and movements. At CES 2018, Sony also demonstrated an 8K display featuring a prototype of the company’s X1 Ultimate next-generation picture processor, which has twice the real-time processing power compared to the current X1 Extreme. Using its beastly processor, Sony was able to display 8K HDR video with a peak brightness of 10,000 nits, the highest brightness level possible with the HDR format. Compared to even the brightest TVs currently available, the display demonstrated by Sony at CES 2018 was approximately 10-times brighter. One consequence of such amazing brightness is the possibility to achieve truly outstanding contrast in scenes with bright highlights and deep shadows. The Sennheiser HD 800 are generally regarded as the best open reference headphones on the market right now. But there’s one small problem with them that’s actually a deal breaker for many people: they leak a lot of sound and offer very little in terms of noise isolation. So, if your neighbors aren’t the quietest people on earth and your roommates the most tolerable, you might want to consider getting the newly introduced HD 820 instead. Think of them as the HD 800 with Sennheiser’s unique glass transducer covers slapped on the earcups to prevent the sound from leaking out. According to Sennheiser, the HD 820 are the most transparent-sounding closed headphones in the world, and we have no reason to doubt that statement. As is always the case with closed headphones, you can expect the HD 820 to have deeper bass than the HD 800 and a slightly smaller soundstage. To promote sun safety, the global beauty leader L’Oréal has developed the first battery-free wearable electronic UV sensor. Called UV Sense, this small wearable that is designed to be worn for up to two weeks on the thumbnail continues where the company left off with its previous UV-sensing product, the My UV Patch. The UV Sense measures only nine millimeters in diameter and is two millimeters thick. According to L’Oréal, the sensor is powered by the user’s mobile phone and activated by UVA and UVB rays. The accompanying mobile app translates and transfers data from the sensor and presents them in a human-readable form. L’Oréal plans to make the UV Sense available on a limited basis in the U.S. for the 2018 summer season, and a global launch should happen in 2019.